New mesh topiaries for CHIC2 birthday celebration! 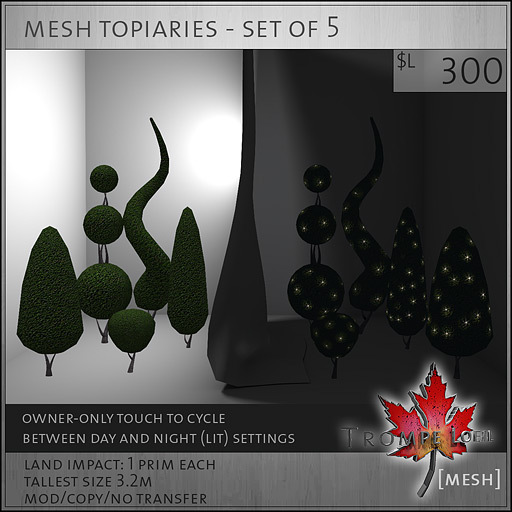 We’ve updated our popular topiaries into mesh, with new fun shapes, a lower prim count, and the same fun sparkling lights option! Each topiary is only 1 prim each at size, with the tallest at 3.2 meters, these are ready out of the box to decorate your home, patio, garden or full region. Owner-only toggle to a sparkly lit version (full bright, looks best at nighttime settings). This new topiary set is available only at the CHIC2 birthday celebration starting June 3! The Godswood Garden Skybox – new for FaMESHed June 2012!